Daily Illuminator: Munchkin Meets The Red Dragon Inn On Kickstarter! March 26, 2018: Munchkin Meets The Red Dragon Inn On Kickstarter! You meet in a tavern . . . Many adventures have begun this way, and SJ Games is happy to start a new adventure with SlugFest Games, with our new crossover between Munchkin and The Red Dragon Inn. Introducing The Red Dragon Inn: Allies - Spyke and Flower, and Munchkin: The Red Dragon Inn now on Kickstarter! That's right, not one, but two expansions, one for each game. 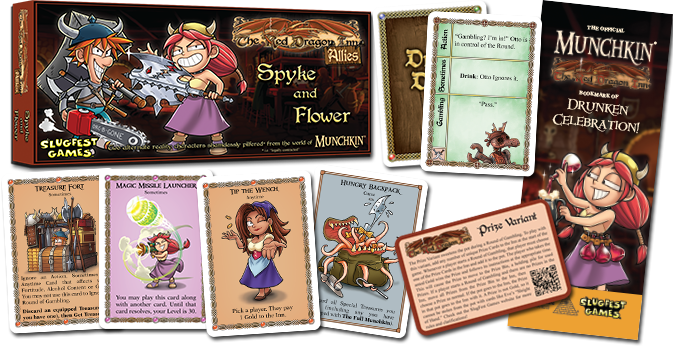 The Red Dragon Inn: Allies - Spyke and Flower features the iconic characters from Munchkin, ready to add to any game of The Red Dragon Inn. Plus, it functions as a playable two-player game right out of the box! Simply use Otto the automatic third player, and you're ready to go. It even comes with a Munchkin bookmark to use in our game – how cool is that? For you Munchkin fans, Munchkin: The Red Dragon Inn brings the characters from SlugFest Games' hilarious series into the fold, with 29 new cards. This mini-expansion features Monsters, Treasure, and new Drinks to consume – a variation on one-shots – all with art from Tom Siddell (Munchkin Booty Guest Artist Edition). 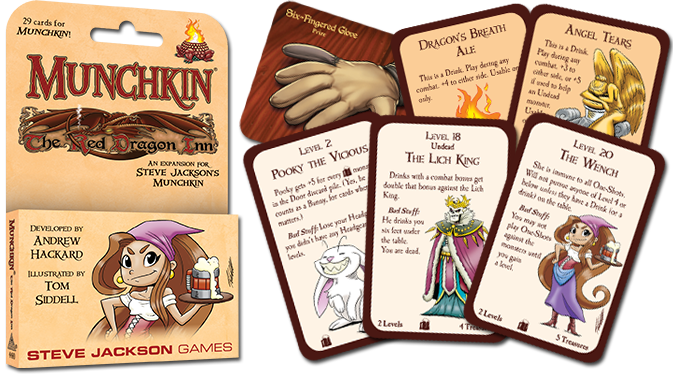 And it includes a special Munchkin-sized promo Prize card for The Red Dragon Inn! So grab your drinks, kick down some doors, and help fund this awesome crossover between two classic games! The next round is on me!